The Ketogenic Diet for Health: Keto-adapted, but no ketones? One of the cheapest and easiest ways to measure ketones is to use ketone test strips, e.g. Ketostix. Ketone test strips use a chemical reaction to measure acetoacetate (see below), usually in urine, though the same method can be used for blood. (Not to be confused with the blood strips used at home for beta-hydroxybutyrate.) However, acetoacetate test strips are of limited usefulness. For one thing, urine concentrations are affected by dilution, which means that they are affected by how much you drink. But the problem is deeper than that. Acetoacetate is only one of the three ketone bodies (see below). Initially, when you start a ketogenic diet, acetoacetate will make up about half of the circulating ketones , but when you are keto-adapted, it makes up only about 20% of the ketone bodies in circulation (see below). Morover, the sensitivity of the strips is a little lower than optimal for our purposes. They register negative unless the concentration is quite high. So, it is not uncommon for a keto-adapted person to measure negative for acetoacetate. The graph above shows that in the ketosis of fasting, the proportion of acetoacetate (the top, white part of the bar) is much smaller than that of beta-hydroxybutyrate (the black part). In the study here, after 21 days of fasting, the average level of blood acetoacetate was 1.04 mmol/L, while the beta-hydroxybutyrate level was 4.95 mmol/L . In another study of epileptic children on ketogenic diets, after 3 months, the average acetoacetate level was 1.182 mmol/L, while the average beta-hydroxybutyrate level was 4.21 . The level of ketosis in fasting and in epileptic treatment is a little bit higher than for the typical ketogenic dieter who is simply trying to lose weight, enhance athletic performance, or improve their cardiovascular risk profile, for example. In those cases, beta-hydroxybutyrate levels are typically 1–3 mmol/L. Since the ratio of acetoacetate to beta-hydroxybutyrate is only about 1:4, acetoacetate levels will be only about 0.25–0.75 mmol/L for keto-adapted people. The acetoacetate measure does not register as positive until about 0.5-1.0 mmol/L , so those values will often register as negative for acetoacetate. Here are some examples of negative acetoacetate, even while beta-hydroxybutyrate is very high. There is a dangerous state that diabetics can get into called keto-acidosis, which is crucially different from nutritional ketosis (a safe and healthy state), but is often confused with it, because they both involve activation of ketogenesis. Ketone levels in keto-acidosis are much higher than in nutritional ketosis, and it is the monitoring of this state that ketone strips are optimised for. Even though ketone levels in keto-acidosis are higher than in nutritional ketosis, in one report it was found that 57% of diabetics with negative acetoacetate measurements were suffering from keto-acidosis . Most of the cases of high beta-hydroxybutyrate in this study were not also positive for urine acetoacetate. This flowchart shows that it is clinically accepted that even with very high beta-hydroxybutyrate levels, acetoacetate in urine and blood can be negative. The reason acetoacetate is bothered with at all is that it is relatively cheap and easy to measure. What's the best way to measure ketosis? Ketone test strips are a cheap and easy way to confirm ketosis when you have very high levels, such as during keto-adaptation. However, we would expect the false negative rate to be high for keto-adapted people, and for infants, (who are normally in consistent but mild ketosis while exclusively breastfed). So although it can be a good tool when you are starting a ketogenic diet, it is not necessarily reliable as you progress. A negative acetoacetate measure does not imply that you are not in ketosis. If you are troubleshooting, and need more accurate measurements, we strongly recommend a blood ketone meter for beta-hydroxybutyrate. However, be aware that the strips themselves are very expensive. A new breath acetone meter is now on the market. It costs about $100, but it doesn't require any strips, so you pay only once. Unfortunately, like the acetoacetate strips, the measure is only semi-quantitative, and appears to have a relatively high minimum threshold for showing positive. We also don't know how well acetone correlates to beta-hydroxybutyrate, or to therapeutic results. Nonetheless, it is a promising technology, and it requires no pinpricks or pants down. We'd love to hear from you if you've given it a try. "Beta-hydroxybutyrate and acetoacetate are made in the liver in about equal proportions, and both are initially promptly oxidized by muscle. But over a matter of weeks, the muscles stop using these ketones for fuel. Instead, muscle cells take up acetoacetate, reduce it to beta-hydroxybutyrate, and return it back into the circulation. Thus after a few weeks, the predominant form in the circulation is beta-hydroxybutyrate, which also happens to be the ketone preferred by brain cells (as an aside, the strips that test for ketones in the urine detect the presence of acetoacetate, not beta-hydroxybutyrate). The result of this process of keto-adaptation is an elegantly choreographed shuttle of fuel from fat cells to liver to muscle to brain." "Whenever a defect in carbohydrate metabolism or absorption or an inadequate amount of carbohydrate is present in the diet, the body compensates by metabolizing increasing amounts of fatty acids. [...] In ketonuria, the three ketone bodies present in the urine are acetoacetic acid (20%), acetone (2%), and 3-hydroxybutyrate (about 78%)." 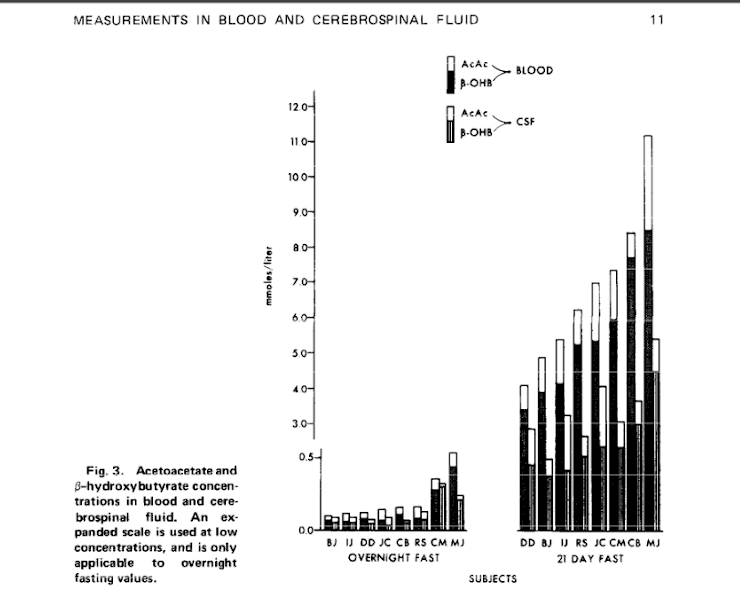 Comparative measurements of glucose, beta-hydroxybutyrate, acetoacetate, and insulin in blood and cerebrospinal fluid during starvation. Owen OE, Reichard GA Jr, Boden G, Shuman C.
A randomized trial of classical and medium-chain triglyceride ketogenic diets in the treatment of childhood epilepsy. Neal EG1, Chaffe H, Schwartz RH, Lawson MS, Edwards N, Fitzsimmons G, Whitney A, Cross JH. Epilepsia. 2009 May;50(5):1109-17. doi: 10.1111/j.1528-1167.2008.01870.x. Epub 2008 Nov 19. "One hundred forty-five children with intractable epilepsy were randomized to receive a classical or an MCT diet." "Classical diets were started at a 2:1 ratio and gradually increased to a 4:1 ratio as tolerated over 1–2 weeks; in a few children the ratio was kept at 3:1 for longer because of tolerance problems. Protein was generally kept at World Health Organization (WHO) minimum requirements for age (World Health Organization, 1985). MCT diets were commenced on a full prescription for carbohydrate (generally 15% energy), protein (usually 10% energy), and long-chain fatty acids (usually 30% energy). The MCT fat was increased incrementally over a 7–10 day period as tolerated, to an initial level that was usually 40–45% of total dietary energy. Diets were fully supplemented with vitamins and minerals. "Subsequent to starting the diet, all children were reviewed as outpatients at 3, 6, and 12 months. They were also closely monitored by telephone between clinic visits. Diets were fine-tuned as necessary to improve ketosis and optimize seizure control. The parameters within which the two diets could be modified were defined before study commencement. Overall energy prescription was adjusted on both diets as needed. 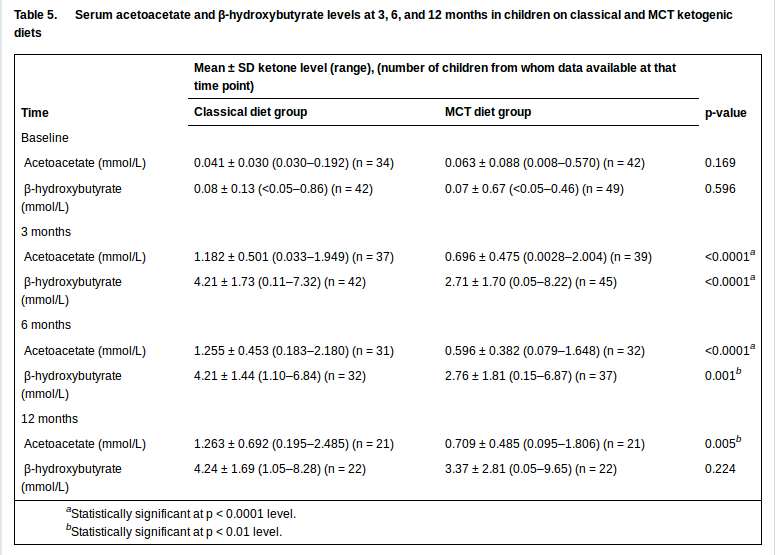 Ketogenic ratio on the classical diets was kept between 2:1 and 5:1 (most classical diet children were on a 4:1 ratio, a few were on a 3:1 ratio, and two children needed a 2:1 ratio for a short period). Fine-tuning on the MCT diets involved adjusting the proportion of MCT and carbohydrate in the prescription. MCT was usually started at 40–45% of energy, and was increased up to 60% if necessary and tolerated. Carbohydrate was usually started at 15% of energy, and was reduced to a lowest value of 12% if necessary. Carbohydrate was reduced to improve ketosis only if an increase in MCT was not possible because of poor tolerance. Other modifications on both diets were fluid intake and meal distribution. Protein intake was increased as needed to meet requirements." From: Clinical Methods: The History, Physical, and Laboratory Examinations. 3rd edition. Walker HK, Hall WD, Hurst JW, editors. Boston: Butterworths; 1990. "Nitroprusside is available as a test tablet (Acetest) and as a coated reagent strip (Ketostix), both manufactured by the Ames Division of Miles Laboratories, Inc., Elkhart, Indiana. With Acetest, after 30 seconds the color development is compared to a chart and judged negative, small, moderate or large. The tablet will detect 5 to 10 mg/dl of acetoacetate and 20 mg/dl of acetone. The quantitative range included in each category is 5 to 20 mg/dl for small, 20 to 40 mg/dl for moderate, and 40 mg/dl or greater for large. With Ketostix, the strip is momentarily dipped into the urine specimen or passed through in the urinary stream and compared to a color chart 1 minute later. The scale is negative, trace, small, moderate, and large. The strip is capable of detecting 5 mg/dl acetoacetate but is not reactive to acetone. The ranges are wider and shifted somewhat to the right in the higher zones compared to Acetest so that only 16% of samples containing 20 mg/dl acetoacetate are read as moderate while 24% of samples containing 80 mg/dl acetoacetate are still called moderate. Only 15% of the samples containing 40 mg/dl acetoacetate are judged to be large; 76% are large at 80 mg/dl and 100% at 160 mg/dl. The Ketostix test is most accurate when urines are tested with a high specific gravity (between 1.010 and 1.020) and low-pH. Highly pigmented urine specimens may yield false positive readings. Levodopa will also cause a false positive result. Ketostix strips are less sensitive than Acetest tablets and have a high degree of variability between lots. Acetest, with sensitivity in the 5 mg/dl range, is the preferable method." This test strip will detect 0.5–1.0 mmol/L (5–10 mg/dl) of acetoacetic acid"
"Only acetoacetate and acetone are detectable by reagent strips or tablet tests, which are based on the reaction of acetoacetate (more reactive) and acetone (less reactive) with nitroprusside. 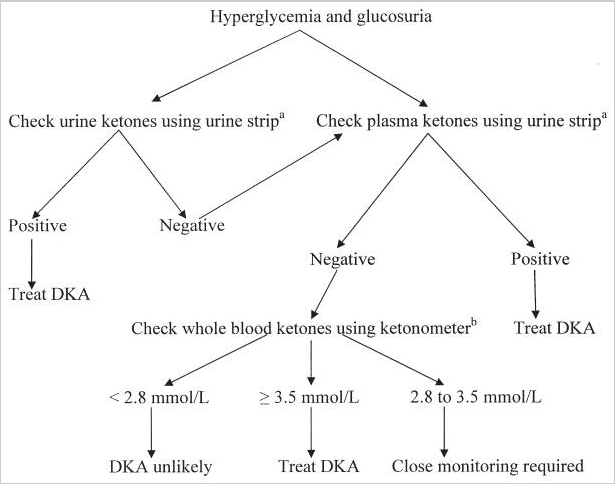 "Urine (and blood) can be screened for ketones by using either reagent strips or tablets [...] The [tablet] is more sensitive than reagent strips and will detect 5 mg/dL of ketones compared with 10 mg/dL for dipsticks." Yutaka Harano, M.D., Masaaki Suzuki, M.D., Hideto Kojima, M.D., Atsunori Kashiwagi, M.D. Ph.D., Hideki Hidaka, M.D. Ph.D. and Yukio Shigeta, M.D. Ph.D.
"MacGillivray et al. recently reported that 57% of the urine tests that were negative for ketone bodies by acetest were associated with elevated plasma 3-OHBA in insulin-dependent diabetes. "MacGillivray, M. H., Voorhess, M. L., Putnam, T. I., Li, P. K., Schaefer, P. A., and Bruck, E.: Hormone and metabolic profiles in children and adolescents with Type I diabetes mellitus. Diabetes Care 1982; 5(Suppl .l):38-47"
This is something that I've been really trying to get a grip with, following as much information as possible, to really determine *what to do* with these measurements. The process of ketoadaptation in and of itself seems to lower ketone readings in most people, often from caloric intake (de novo lipogensis a contributing factor in halting ketone production? Or is it protein and carbs only that impair ketone readings? Are ketones still preoduced but used up so quickly there is equilibrium?). Yes I've read your posts on excess protein and protein in general not halting ketosis and agree with it which is also why I'm so confused. Basically I see it this way; in clinical practice they use ketones to determine if someone is in ketosis. However a keto-adapted person burns away ketones as fuel. So can we really use measurement as a way of determining if someone is in ketosis for long term? I'm a 5"11' man with about 140 lbs lean mass and I eat 90-120g of protein daily, less on rest days, more on exercise days. I haven't had any readings occur from my breathalyzer (maybe time for a new one? I know the electrodes wear out and start to fail over time) which I used previously and had readings as high as .10% while adapting! I also am low enough weight that caloric deficit is a fine line between very little food and maintenance, so perhaps it's the lack of caloric deficit that is giving negatives? I don't know and I'm just using some n=1 to try to pinpoint the combination of your posts, Bill Lagakos' stuff, and other stuff that floats around from bloggers on ketone bodies. Clearly I couldn't be "out" of ketosis or I'd be dead, I eat neither enough carbs (<10g per day) not enough extra protein to feed my brain on glucose. My best guess for measuring keto-adaptation seems to be pointing towards physiological insulin resistance being the best marker. You can start off measuring ketones to make sure you're eating the right amount for your body and activity to "stay" in ketosis most of the time, but eventually that will wane and *that's okay*. When your ketone readings drop, check for physiological insulin resistance by fasting for 16 hours and checking blood glucose. The last time I did that I had a 94, and that was 3 months ago, while I was 6 months into keto. I see others that are on keto for years claiming to read 100-110 or more in some rare cases. I will say, everything I'm reading points towards breath testing being the most useful: it is consistent with blood, cheaper than blood, less painful to test, and even the cheap $10-40 breathalyzers do a great job for a long period of time. Thanks for the studies, more info for the arsenal. Keto-adaptation will lower the acetoacetate (Ketostix) measure, but not the BOHB measure. Our posts on protein and GNG are confusing and widely misinterpreted, unfortunately. Protein at some threshold *will* interfere with ketosis, but that threshold is well above the minimum requirement, as is illustrated nicely in Bill's post. So the notion of "excess" is misleading. Our point was supposed to be that the mechanism behind protein slowing ketosis can't be that there is some amount of protein after which the rest just gets shunted into GNG and "turns into sugar". Rather, some other signal from eating high levels of protein reduces ketogenesis, and *then* since ketones are lower, sugar has to be burned. Anyway, at the levels of protein you are taking, it seems unlikely that you are not in ketosis. Besides the BOHB blood measure, another thing you could do is just measure plain old blood sugar. If you're in ketosis (and presuming no diabetes? ), it should be low, like maybe 65-85. What kind of citations are you offering? For breathalyzers? We'd love to hear more. I agree that flux is hard to deduce from concentration, in other words seeing a high or low concentration of ketone bodies doesn't explicitly tell us the rate of use as a fuel, it says more about the balance of production and use. I remember reading somewhere that activating mTORC1 inhibits ketogenesis and too much protein will activate mTORC1. On another note, rapamycin blocks mTOR and results in increased lifespan in mice even though it increases blood glucose levels and cholesterol. It's interesting that a ketogenic diet does the same thing to some people. Might they have to worry about living longer? There are many reasons to think that a ketogenic diet could increase lifespan. That's another post (or series), though. My n=1 on the Ketonix breathalyser is that if I have high B-OHB in blood (over 1 mmol) I am very likely to register Red and almost certain to be at least yellow. I find it correlates far better with my blood meter than Ketostix in urine, which I now regard as little more than useless due to false negatives. The Ketonix does read alcohol though, so drinkers beware. It is important that we remember we're measuring three different substances in three different bodily fluids in an attempt to assess one biochemical state. Correlation is the best we can hope for. I'm blowing orange consistently. Red only if I've had booze in the past ~18 hours. BOHB averages somewhere around the 1.0 level, +/- 0.5. Ketostix are all over the place, but are correlative enough with the others probably half the time? Had a funny experience this morning when I laid my breathalyzer next to a cotton ball I had used that had isopropyl alcohol on it; when I turned on the meter it did the "danger alert" beeping showing .5, before I breathed into it. Took me a second to figure out why. Makes me wonder how accurate the police devices are. Also, when I did my BK meter, I tested (AM fasting) at .3; typical for me in the morning, while four hours after eating at night usually test 2.0 to 3.5, up to 5.0 occasionally I have yet to see any direct correlation to the highest readings with either intake or exercise. http://ajcn.nutrition.org/content/76/1/65.full includes comparison of all three measures, although not in well adapted subjects. Nice. But yes, it won't be much better than ketostix if it doesn't work once adapted. I'd add this study to the mix as well ---> PMID: 11751546 "Breath acetone as a measure of systemic ketosis assessed in a rat model of the ketogenic diet"
Actually, there are 2 ketones substrates for fuel in our body - acetoacetate & acetone. Beta-hydroxybutyrate is not a ketone technically/chemically speaking, but for us lazy biologists we just lump it in there as it serves the same purpose (mostly, apparently). I'm nearly always orange/yellow on the Ketonix breathalyzer - so far it seems to follow BG readings quite well (I use Precision Xtra for both blood sugar & blood BhB). Seems that the breathalyzer will be orange/yellow or even red as long as my BG readings are sub 90mg/dL (which is most of the time). Interestingly, even when my BG readings skyrocket due to a HIIT session the breathalyzer also shows greater acetone production, showing (again) orange/yellow or red. This is my 30th day on a ketogenic diet (20-50 grams of carbs per day, last three days on zero carbs). I am 175 cm tall and overweight but have reduced my weight from 97 kg to 88 kg. My acetoacetate levels have been recently around 4 mmol/l in the mornings and towards 0,5 - 1,5 in the evenings measured with Ketostix from urine. This morning I woke up with a heavy headache and by noon I had to throw up everything. After this Ketostix gave me a result of between 8 and 16 mmol/l - or little less than 16, it was difficult to see! I got a bit scared of this sudden peak and found this site. Now it's midnight, the headache is gone, and ketones have come down to between the categories of 1,5 and 4. Does this mean that when my Ketostix result was around 16 mmol/l the betahydroxybutyrate concentration in the blood was 4 times that?!? What is your opinion, is this abnormal or potentially dangerous? Could it be that I am burning visceral fat heavily, for example? I doubt it. I would guess the urine measurement is simply a result of dehydration. I agree that the Ketostix are not very useful. Jimmy Moore has a good explanation in his book Keto Clarity about why, but your article is a bit more detailed and I appreciate that. I am so glad that we have the sophistication of blood ketone meters available to us. Hopefully the test strips will become more cost effective in the future. I have requested a free meter through the link you posted in another article here, so I might be able to start testing my blood ketones in the near future. Interestingly, I have another way of telling if I am burning body fat or not. I have a the skin version of celiac disease known as dermatitis herpetiformis (an unfortunate name because it has nothing whatsoever to do with herpes). When I eat glute/gliadin proteins present in wheat, rye, barley, and oats, I break out with a skin rash on my knees, elbows, buttocks, groin, chin, and the knuckles on my hands. It itches fiercely. I finally self diagnosed this in the early 1990s after 8 years of unabated itching. I stopped eating all gluten/gliadin containing foods, and the rash disappeared completely in 3 weeks. The only time is has ever reared its ugly head since then is when I enter a state of ketosis during fasting. Now that I am practicing a Ketogenic diet, it is again making an appearance. My interpretation is that the gluten/gliadin has been stored in my fat cells for the past two decades and when my body accesses body fat for energy, these proteins get liberated from where they have been stored and re-enter my blood circulation in the process of being eliminated. This is a sort of objective indicator for me that I am indeed burning body fat for energy, even though the Ketostix are showing no evidence of acetoacetone in my urine. It will be interesting to see how long it lasts. It also makes me wonder how many other toxins come out of our body fat during the initial stages of a Ketogenic diet that are less visible to us. I wonder if this is one reason why many people feel a bit under the weather when they first begin a Ketogenic diet. That's interesting. In the last year I have heard of what people call the "keto rash". You should search for it. I don't know much about it other than no one really knows what it is, and as far as I know it hasn't been reported in clinical studies. What would be your opinion on this blog post? What I've posted here is consistent with Wooo's contention that BOHB is higher than AcAc, after ketoadaptation, but it is in disagreement about ratios pre and post adaptation. My source on that is in reference , which comes from Volek and Phinney, where they say that the ratio is 1:1 before adaptation, and that it rises after. Volek and Phinney, however, do not tend to give citations, and this passage was not an exception. Nonetheless, Wooo's source is even more nebulous than that. I.e. it is stated without reference at all. 1. 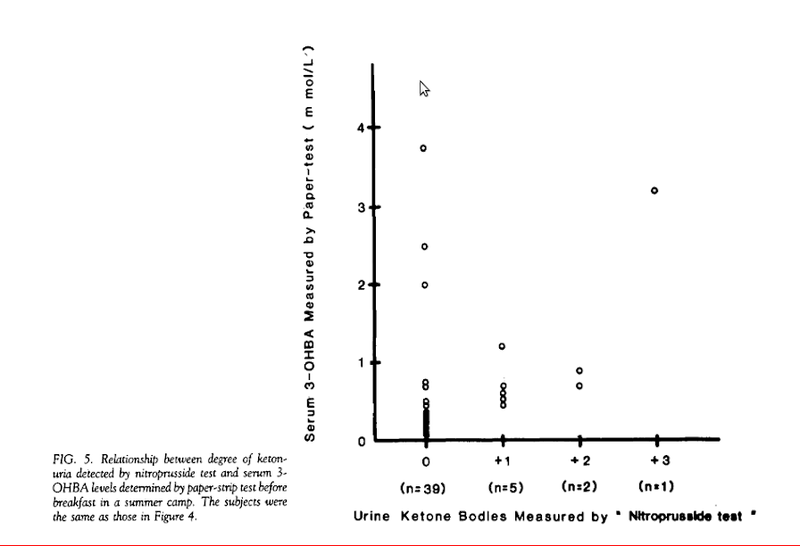 Urine strips lack sufficient sensitivity, particularly at milder levels of ketosis. Wooo mentions this, but considers it a less likely explanation than that other people are merely stupid. In particular, she has an axe to grind against people like me who eat an ad libitum meat only diet. Ad libitum meat only diets are typically only mildly ketogenic once weight stability is reached. We rarely register urine ketones, but we do show acetone in the breath, and low, but positive BOHB. 2. I have presented evidence that even in clinical situations of keto-acidosis (where the BOHB:AcAc ratio is still high, just as it is in epileptic keto dieters, who are clearly keto-adaptated), that false negatives on urine AcAc are so common as to require documentation for practitioners not to conclude that a patient is not in ketosis. Therefore, we don't need to claim that people in ketosis who don't register urine ketones are drinking, not actually keto-adapted, or can't read the strips.